There could hardly have been a more telling example not merely of wastefulness and ecological ignorance of covering this highland of hardwoods with mean spruces but of a more general policy of imposing a purely industrial will upon our heritage of natural resources. Ever since attempts have been made to rescue the parkland and ancient woodlands of Croft from the results of a policy dating from 1919 to provide pit props for the next Great War. Now, 60 years after Massingham wrote these words, we have a chance, to start the process of restoring one of the finest landscapes, both historically and ecologically, in the West Midlands. September 23rd 2014 Restoration of the Croft Estate landscape has now started. This photo was taken from the southern edge of the area with the Ambrey Iron Age fort looking south. Pontrilas Saw mills has the contract to fell and remove 20 hectares of the conifer stand between the Ambrey and the un-conferized park of the parkland and Fishpool Valley and to leave all remaining broadleaves taking care not to damage any of the remaining veteran trees. Sadly, a wind blown conifer stand retained by FC against NT advice destroyed a VT in January 2015 (see more details below). 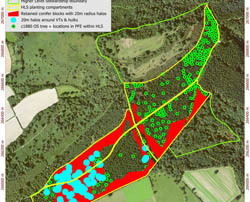 The Forestry Commission has produced an amended version of the much criticised 2010 - 2020 Forest Design Plan (FDP) for the Croft woods along with amended maps, see here. Amendments do not cover Oaker Coppice, Bircher coppice or the Yeld block which remain as 2010 version. The part of the FC which manages the "Public Forest Estate" (PFE) will become the "Public Forest Estate Management Organisation" (PFEMO) along with re-vamped objectives including "To maintain and enhance the natural and historic assets comprising the estate" see the July 2013 summary document. Since this change requires primary legislation we are still waiting for Government to find parliamentary time. Until recently the history and ecology of the North Herefordshire PFE woods have been virtually ignored in favour of serial softwood plantations. This year (May 2014) the current Mortimer Forest FDP ended and that of the Wigmore Rolls will end in 2015. These are important historic sylvan landscapes, both containing Medieval parks for example, and both have considerable habitat restoration potential. ◄ Georeferenced maps and air photos from the Isaac Taylor map of Herefordshire 1754 showing the Croft park pale to 2013, includes historic air photos from 1948, 1953 census data, 2010 Forest Design Plan and amendments along with high resolution versions of each image for download. You can also pan and zoom into high resolution historic maps and air photos and compare with now: click on these links Tithe Map 1840, 1st edition OS 25" to the mile c1885, RAF 1948 and RAF 1959. Allow time to load and render to full resolution if slow connection. Synchronisation can be switched on or off. Pan/zoom with mouse or keys. Back browser arrow to return to main page. ◄ HLS planting opportunity maps. Map sequence showing the 2014-2024 Higher Level stewardship (HLS) area and the PFE planting area within that. The new planting needs to reflect the known historic tree distribution of the parkland prior to the FC lease. Only the 25 inch to the mile OS [c1885] gives reliable tree distribution and locations which was an average of 9 trees/hectares in the PFE area equivalent to 15% canopy cover, a figure known to be less than in earlier years. The FDP conifer stand retentions reduce the available planting area as do the surviving veteran trees and hulks which require an exclusion zone around them. The map sequence explains these constraints and opportunities. ◄ gallery of photographs of the remains of the old parkland trees surviving within the conifer plantations of the PFE leasehold. The Croft estate is considered to be the second most important site in Herefordshire for saproxylic (rotting-wood dwelling) beetles [see report English Nature Research Report no. 574 by Keith Alexander 2004]. 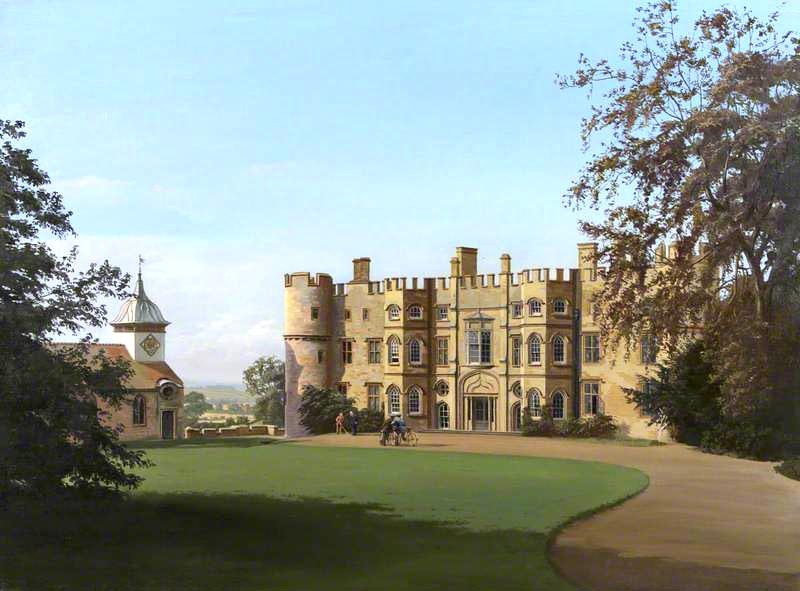 Restoration of the parkland from the present conifer plantations will greatly enhance invertebrate interest of the estate and other classes of fauna. ◄ Root bowl of toppled old oak. Very sadly, one the last living veteran trees within the conifer blocks (featured in above sequence) has been toppled by one the conifers that FC insisted, against NT advice, should be retained after the clear felling. This conifer (see the top snapped) blew down in mid January this year 2015, crashed into the old oak pushing it right over. These conifer retentions were recommended by FC's bat consultants but strongly opposed by NT who warned this might happen (see below). ◄ The story of Common Wood which occupies the NE flank of the Croft scarp overlooking the Lugg and north of Pokehouse Wood. This 20 hectare ancient woodland compartment is part of the PFE lease but owned by a Mrs Hodges rather than the National Trust. Although it had been planted with conifers pre WWII at the time of its felling in 1999 there was advance regeneration of native trees and flora. Despite public pleas the FC re-coniferized the whole wood knowing it was ancient. The wood also contains the only know semi-nature Lime population in the Croft woods. ◄ Photographic portrait of the main Croft conifer block and a couple of examples of the likely effects of restoration. In 2011 a systemic botanical survey was carried out on a regular 100 meter grid array the results of which are in this report. The Croft FDP uses "ecological" arguments to keep the conifers on the ancient woodland parts of PFE for many decades with talk about micro-climates. This ignores the known history of coppicing and that PFE and others have successfully clear felled large conifer areas for conservation reasons notably the PFE Haugh Wood, Moccas Park and Credenhill Park Wood. ◄ Oblique air photos of the Croft Estate woods from light aircraft and microlite 1961 to 2010. Bats and the conversion of conifer plantations to wood pasture. Restoring the Croft parkland following felling of the main Croft conifer block has been the long term objective for decades, but there are a small number of dissenting voices and these have influenced the Commission FPD to retain conifers so it is worth examining their objections in detail. References are hyper-linked to the originals. Referring to Berbastelle & Bechstein bats, Henry Scofield of the Vincent Wildlife Trust states: large-scale reversion to wood pasture would have a detrimental effect on these species [page 23 Croft FDP 2010]. Rebecca Collins and David Wells contend that restoration would be damaging due to: loss of commuting routes through felling of conifers and Flying insects associated with the conifer crop may also provide a foraging resource for bats… it may be decades before pollards regrow to a sufficient extent to provide an equivalent resource for bats [pages 2 & 18, Bat Survey Report, Woodland North of Croft Castle 2013]. This photo is just one year after the National Trust felled a conifer block adjacent to Fishpool valley yet these consultants would have you believe that decades must pass before insects are as numerous here as in the lifeless conifer blocks! A light trap would quickly show the absurdity of this notion. Scofield’s stated claim that the restoration would have a detrimental effect on bat species is challenged by recent studies into the habitat preferences of Bechstein bats: A study on the population size, foraging range and roosting ecology of Bechstein’s bats at Grafton Wood SSSI Worcestershire, January 2013 by E. Palmer et al. 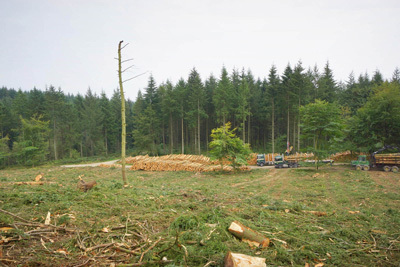 Grafton Wood has been subject to some fairly large conifer clear fells as part of its woodland restoration programme (photo below). 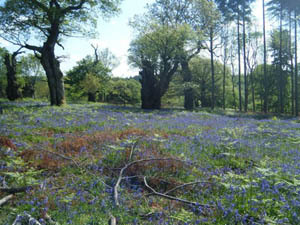 Grafton wood has a recently discovered Bechstein bat population of at least 55 individuals: Although this work was carried out after the removal of conifer plantations from Compartments A and D in Grafton Wood, there is evidence in other studies that this habitat change would not have harmed Bechstein bats [section 11.13]. the majority of European bat species roost in deciduous trees, primarily oaks and beech (Boye & Dietz, 2005). Alive conifers are avoided, because they do not offer suitable cavities, principally due of the production of resin… Furthermore, in our study, Myotis bechsteinii roosted in trees with a low canopy closure and few branches on the trunk. In that way, the cavities, which were usually located in the trunks or in the first branches of the canopy, could profit of high solar radiation and good heat accumulation. The south-facing roost entrances are in agreement with the hypothesis that thermal conditions play an important role in roost selection by female Bechsteins bat. 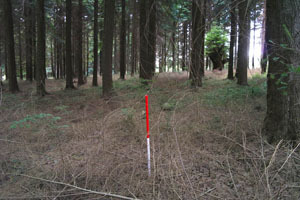 Although no features on the standing conifer crop were identified as potential roost sites, the conifers were not surveyed exhaustively, and so roost sites may be present in these trees. Bats and their roosts are protected under UK and EU legislation. This, despite the fact that in 4 separate days of survey this year (2013) there was no evidence of any activity around the 208 veteran trees in the conifer block, nor any activity in and around its 14 bat boxes, indeed no roost sites anywhere, nor did they find any Becksteins. 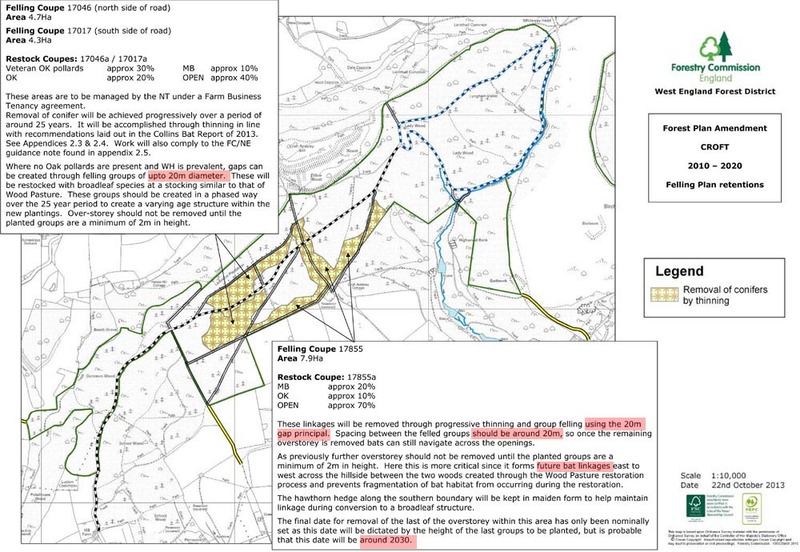 The Wells and Collins "20 meter gap theory": These two consultants would have us believe that bats cannot cross gaps of more than 20 meters [section 5.6] and despite producing no evidence for this statement, the Forestry Commission (who commission them) have elevated it to a principle of forest management, which would also make most UK forestry non-viable. See Appendix 1.3.2 of the amended FDP. a combination of detector monitoring and radio-tracking found that the impact of the gaps created was, at most, to delay the horseshoe bats crossing of the scheme by a few minutes. Both greater horseshoe bats and barbastelles were found to cross these gaps on several occasions a night. there may be too much emphasis on hedgerows, for example, they had seen barbastelles crossing ploughed fields to get to woodland. and that [Point 4]: There was a discussion about a radio-tracking study of brown long-eared bats and pipistrelles (10 bats). One female pipistrelle had headed straight out across field, one Natterer’s bat and brown long-eared bats had stuck to the expected flightlines. There are other examples of bats flying directly out – particularly when heading straight out at dusk or returning at dawn. Another example was given of a greater horseshoe bat in Wales crossing to an island. and [point 11] One also needs to consider that it may not be due to the gap itself but due to cessation of feeding resource, i.e. the bats turn around to go feeding back the other way. For such species as E. serotinus, N. noctula and M. myotis, who often travel several kilometers from day roosts to their foraging areas (Degn 1983, Kronwitter1988,Cattoetal.1996, Robinson & Stebbings1997), such forest fragmentation as seen in the study area does not constitute a barrier in traveling to foraging areas and dispersal. Wells and Collins have persuaded the Commission that bats love conifer plantations so much that a significant proportion of the conifer stand within the agreed restoration area should remain and only be removed gradually over the next 25 years. With so much published evidence and practical experience contradicting these consultants, the Forestry Commission should review the FDP management proposals in respect of bats and their habitats in the Croft PFE and take advice from bat experts.